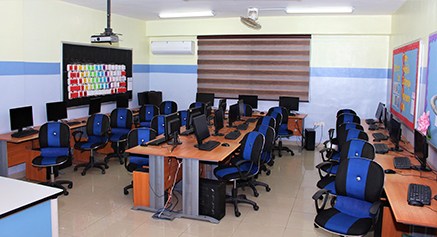 Within the IIS orientations toward implementing the latest techniques in the fields of contemporary ICT, IIS has established three computer labs furnished with high sophisticated technology and additional computer accessories. We seek to take accreditation from Microsoft to enable students, by the end of the basic stage, to obtain the license of mastering computer skills. Our computer lab is a great place! It is a warm and comfortable room, which is the real place to learn and have fun at the same time. The lab is equipped with all necessary equipment like internet, modem, printers and scanners. There are eighteen computers monitored and controlled by the main computer with which the teacher can control all other computers for both presenting lessons and other safety matters. The ICT labs also incorporate use of interactive whiteboards. The International Independent School recognizes the educational value of students and staff utilizing electronic communications systems to enhance learning through the responsible access to global information and communication. We believe that the internet offers vast, diverse and unique resources that can aid in the provision of educational excellence through resource sharing, data collection and communication. Students are introduced to positive computer ethics and are taught the skills to be respectful and safe "cybercitizens" in the digital age. Students must treat all computer equipment with care. They will be held responsible for any items that are improperly handled and/or broken intentionally. Etiquette: transmitting or accepting information that contains swearing, racism, or indecent materials. Be polite and respectful. Harm to others: any act harming another individual. Illegal activities: making illegal copies of software (whether licensed or otherwise without the permission of the teacher). Vandalism: the deliberate attempt to harm or disrupt any part of the computer facilities including hardware software, data or any other component. This includes attempt to harm other installations. Use of computers for purposes other than education. Personal safety: personal information that identifies the user should not be transmitted over the internet. The use of the Internet is a privilege, not a right. Inappropriate use may result in the cancellation of those privileges. Staff intervention will be made in cases of user policy violations. As of 2016, a new lab was established to accommodate 60 students for various purposes. Students can conduct researches for reports or research for/ during class for assignments. The lab is also used for computerized tests like the MAP test and others. Students have access to the lab with either their teacher during a specific class or with an ICT lab technician during their break times. Students at IIS learn by doing and working as researchers in the field of academic specialization. Here at IIS we ensure labs of are highest quality and are regularly renovated and equipped with state of the art instruments. There are four scientific laboratories which have been designed to meet high standard specifications for each of the Science subjects: General Science, Chemistry, Physics and Biology. Labs also incorporate ICT to serve the teaching process; an interactive whiteboard to help explain scientific experiments and concepts and a data show to provide additional resources. Special attention is taken into consideration and to the requirements of safety and security of the laboratories and scientific curricula. The labs are airy with natural sunlight lighting the room. 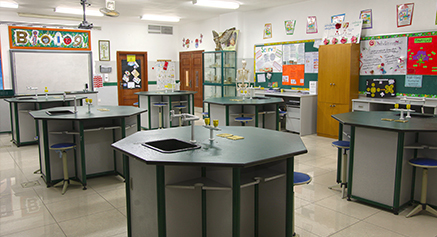 Labs are accommodated with stations for both group and individual experiments. The labs are only accessed in the presence of a lab technician or the subject’s teacher. To guarantee staff and student safety, chemicals are stored in fume cupboards and rooms are prepared with showers or eye baths, gas detectors and fire extinguishers.